rec. Kuusaa Hall, Kuusankoski, 30 Nov 2007, 6-7 Aug 2012. In the 1970s LP cycles of Liszt’s transcriptions of Beethoven symphonies exercised some fascination. Those first forays by Cyprien Katsaris have been emulated by a fair few pianists since then. 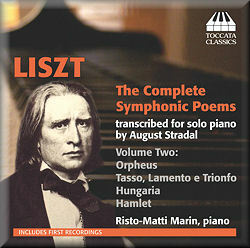 August Stradal, whose life overlapped with that of the composer by some 26 years, has done a similar service for Liszt in making thoroughly grown-up versions of Liszt’s thirteen tone poems. Stradal was not the first – Malcolm Macdonald in his extended liner essay mentions that Carl Tausig prepared solo versions of eleven of the twelve works but some of these have been lost and what survives lacks the worked-through finesse and burly grandeur of Stradal’s efforts. Liszt made his own two piano version of these works but Stradal’s inspired efforts open the door to a much wider constituency. It is interesting to note that the orchestral versions themselves were prepared by Joachim Raff from Liszt’s piano manuscripts. If you have already been drawn to Risto’s earlier Toccata volume then you will have acquired this one long before this review appears. Others dipping their toes into the cycle cannot fail to come away from the experience impressed. The diminutive Orpheus drips self-absorbed romance and ominous atmosphere. Much of this mood-concentrated music exercises a sort of hypnosis on the listener – try the sustained slow-swirling introduction to Tasso. Hamlet establishes a similar spell. It has plenty of gloomy clouds but also grumbles, cascades and raves with Mephisto fury. In these aspects it is redolent of Malediction and Totentanz. Contrast the poetry with the Francesca da Rimini-style storms that follow. Risto is not short on panache as we can hear in the often resplendent final pages of these works. Hungaria follows Tasso. Alongside its struttingly rustic chivalry even the bombast works well. The shrill bagpipe whistle at the end of the poem comes off far more splendidly than it has any right to do from a ‘mere’ piano. I am not at all sure that these solo versions do not work better as pieces of music than the orchestral editions which in Haitink’s (Philips) hands often had my attention drifting. Masur (EMI) was better as was Solti (Decca) but even they struggled. Roll on Risto’s cycle of the Stradal Bruckner symphony arrangements. Stradal’s version of Bruckner 8 played by Risto is something I would very much like to hear. I can live in hope. Meantime keep scanning the skies for vol. 3 of this eminent Liszt entry.